Here is a list of Important Awards in India which will help you in exams like UPSC, BPSC,SSC MTS.SSC CHSL, SSC CGL,Railways and other Banking Exams like IBPS, RBI, SBI Clerk etc. In India,people are appreciated by Government for valuable contribution in variety of services, fields and areas. Giving away awards is the way to make their contribution more memorable. All awards in India are named accordingly based on the field of contribution. 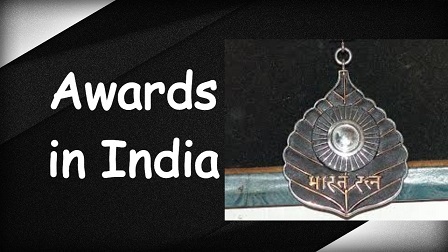 Here is the list of all important national awards of India such as highest civilian awards, Military Awards, Literature awards, Particular awards and Bravery awards etc. Civilian Awards are distributed to people for good work in fields such as art, literature and education, sports, medicine, social work, science and engineering, public affairs, civil service, trade and industry, etc. Indian civilian awards can be further categorized into following four types in the decreasing order of their value. Bharat Ratna: It is the highest civilian award given by the Republic of India for the good work in the field of science, Arts, literature, sports etc. The awards were started in year 1954. A Sanad (certificate) signed by the President and a medallion is presented at the time of distribution of awards. Padma Vibhushan: It is second highest civilian award and is given for exceptional and distinguished service. Padma Bhushan: This award comes second in under the list of Padma Awards and is the third highest civilian award of of India given for distinguished service of a high order. Padma Shri: The last and fourth highest civilian award in India is Padma Shri which is awarded for distinguished service. Military Awards are awarded to defence persons for their extraordinary bravery and courage and to honour them for their distinguished services during times of war and peace. Param Vir Chakra: it is the highest military award given. Before independence Victoria Cross was given by British government but later on Param Vir Chakra replaced it. Maha Vir Chakra: It is the Second highest Military decoration of India, presented to those who show conspicuous gallantry in the presence of the enemy in all three areas that is on land, at sea or in the air. It is equivalent to Medal of Honor given in the United States and Victoria Cross of UK. Vir Chakra: The third award in the list Wartime gallantry awards is Vir Chakra. It was replacement of awards before independence like British Distinguished Service Cross (DSC), Military Cross (MC) and Distinguished Flying Cross (DFC). Ashok Chakra Award- Equivalent to Param Vir Chakra, it is awarded for showing courageous action or self-sacrifice away from battle field. Kirti Chakra- Second peacetime gallantry award after Ashok Chakra Award in terms of reputation. Shaurya Chakra – Third in the list of peacetime gallantry awards. Gandhi Peace Prize awards- Named after Mahatma Gandhi, this International Gandhi Peace Prize is given away annually by the Indian Government as a tribute to the ideals espoused by Gandhi. The award was initiated on 125th birth anniversary of Gandhi ji on 1995. Indira Gandhi Prize – This award is also known by other names such as Indira Gandhi Peace Prize or the Indira Gandhi Prize for Peace, Disarmament and Development. It is given to those individuals or organizations that have done appreciable efforts in promoting peace at international level. Jyanpith Award – Highest literary honour Award in Literature of India. Rajiv Gandhi Khel Ratna – Highest rank in sports awards category. Was started in 1991 in the memory of Late Prime Minister Rajiv Gandhi. Dronacharya award – This award is given to coaches and sports teachers for producing great skilled teams and individual players in various sports. Dronacharya awards were initiated in 1985. Arjuna award– One of the oldest national sports award which was started in 1961. This award is given to those sports persons who have continuously shown performed well for three years at international level. Dhyan Chand Award – This sports award is given for lifetime achievement in sports in the memory of Hockey legend Dhyan Chand. Next Article Sports,Cups,Trophies,Terms,Number of Players:Static GK For All Competitive Exams.